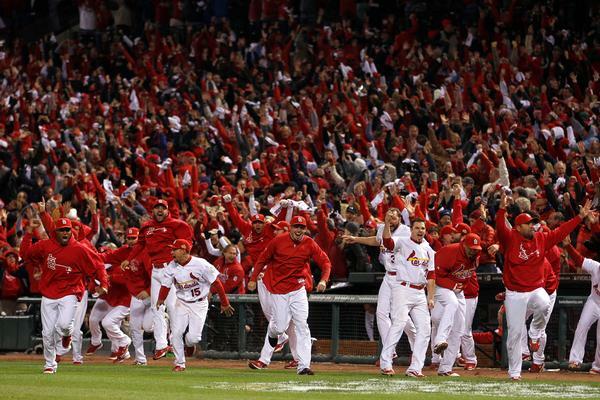 World Series Champion St. Louis Cardinals. Roll that around for a bit in your mind. See how it feels on the tip of your tongue. I haven’t been around lately. Since the last time you saw me here, I have moved across state lines, started a new job, coached my way through a volleyball season, and lived and died with the Cards. I cheered for them, I cried for them, I laughed with them. I just wasn’t here. That’s okay, the Cardinals almost weren’t here either. I live in Missouri now. My coworkers and I daily chatter about baseball. I’ve watched games with family and friends that I haven’t been able to watch games with in years. For the first time since the 2004 World Series, I watched a playoff game while living in the state of Missouri (Okay, I was at game 3 of the 2009 NLDS. That shouldn’t count. It was pathetic). I almost quit this team. I actually had a thought one day about what I would do with all my free time in October. That day was in August. I couldn’t fathom what else could happen to this team – random injuries, snatching losses from the jaws of victory, drama with the manager and a team that I felt was listless. I couldn’t quit this team. Most of you couldn’t either. Suddenly I felt a shift. Games started falling the other way. Call it regression to the mean or getting breaks to fall your way or whatever you want to call it, this team looked different. They almost had… wait for it… swagger. Not in the Phillies’ pitching staff of doooooooom. Not in the Brewers’ “Beast Mode.” Not in the Rangers antler clash. The just had this childlike, sneaking a cookie from the cookie jar determination that they were just going to do this. It was going to happen. They did it. 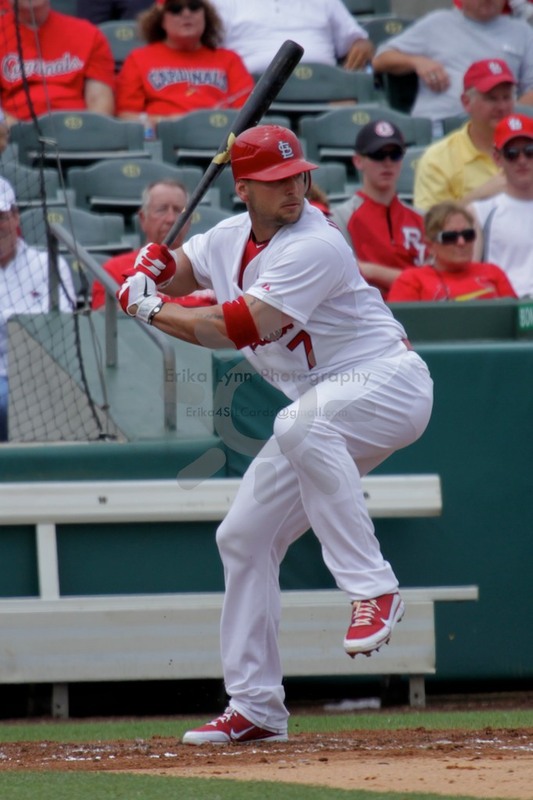 Allen Craig randomly appeared here and there to hit home runs like they were no big deal. 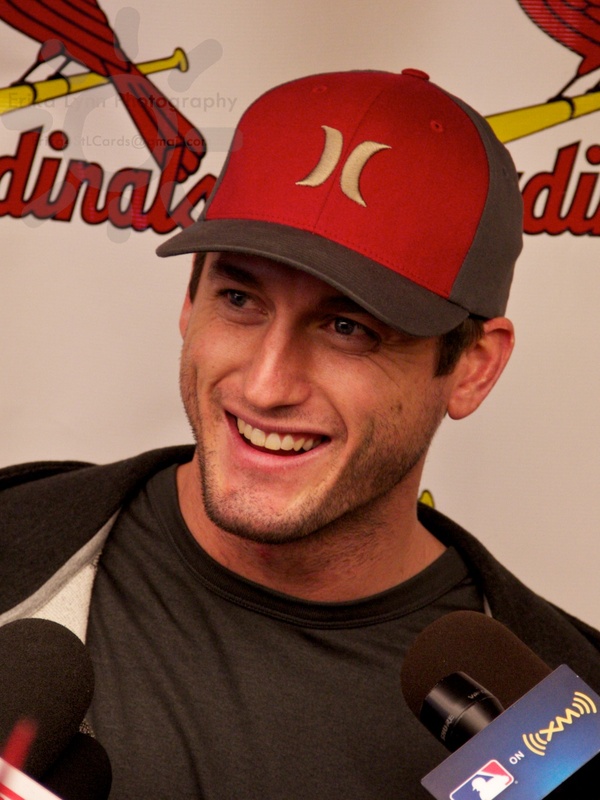 David Freese found a way to have every big hit. 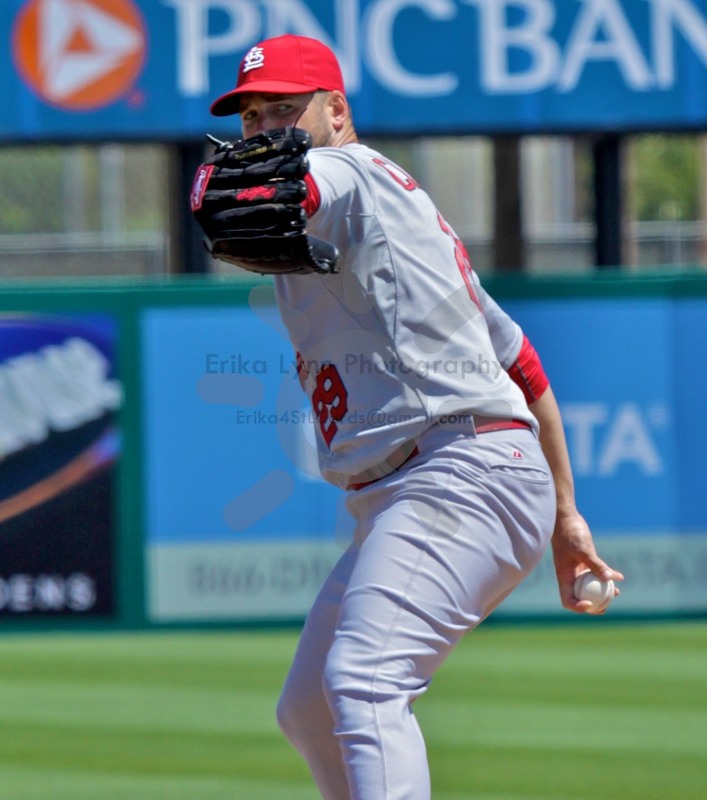 Chris Carpenter pitched with a bulldog mentality on short rest. 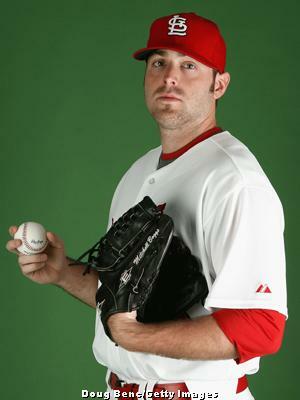 Jason Motte closed the door. 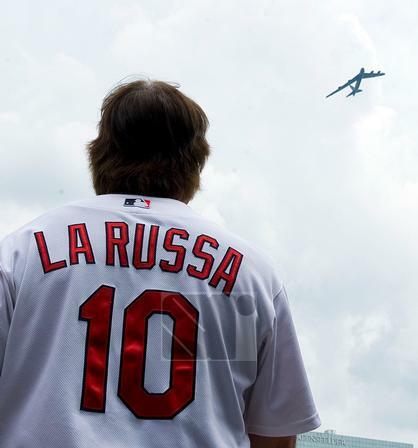 Tony LaRussa smiled. 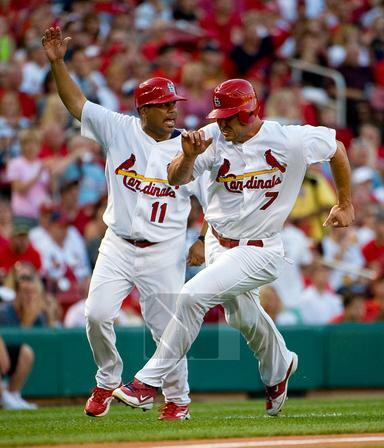 Cardinal fans rejoiced. I sit here, a full 14 hours since the game ended, still feeling speechless as to how to describe this game. But these pictures say it better than I ever could. 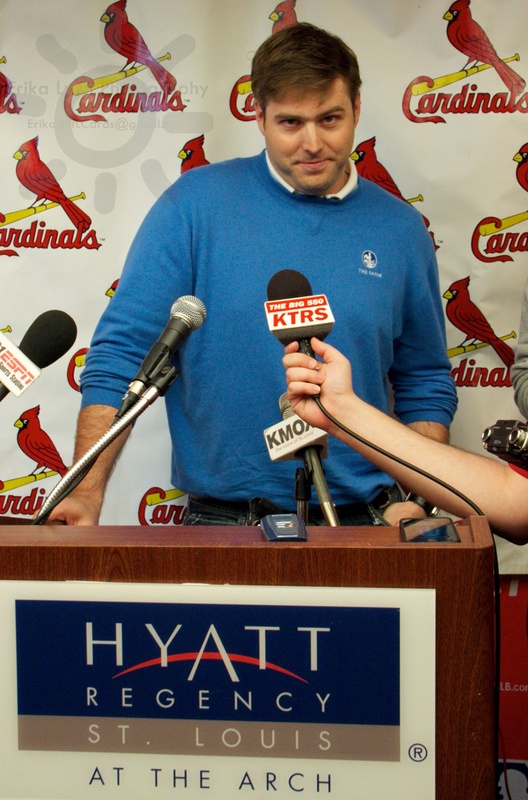 Enjoy it Cardinal fans – especially those of you that couldn’t quit. Are the boys going to make a run at a playoff spot? They continue their absolutely baffling ways of beating good teams and losing to bad ones, so I suppose if the boys play winning teams the rest of the year (they don’t – darn) it’s always possible. Either way, we’re not giving up hope yet!!! We have a surprise for all of you – not one, but TWO new writers! Cadence and Courtney Rippeto are a fabulous sister duo located in the St. Louis area, and have thankfully accepted our offer to join the team. More about them will be coming in the next week, but their big premiere is here now talking about their experience with photo day! Entering the weekend 8 games behind the Reds, we took the time to enjoy the Friday and Saturday Cards/Reds games for what they were worth; photo day on the field and booing Brandon Phillips. 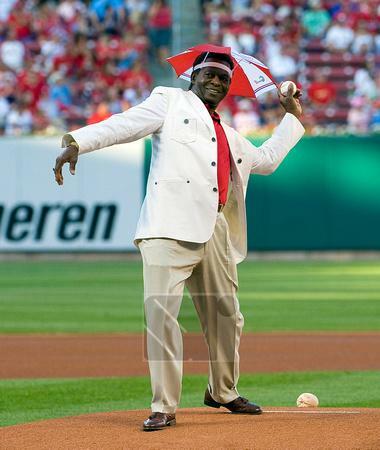 Obviously, if you watched any of the games, you would know that the “love” for Brandon Phillips continued all weekend. Even the Reds fans sitting next to us on Saturday said “I hope that he gets a hit so it will shut them up.” HAHA. Sorry, Reds fans, but the hate will never disappear for Phillips, and he brought that upon himself. 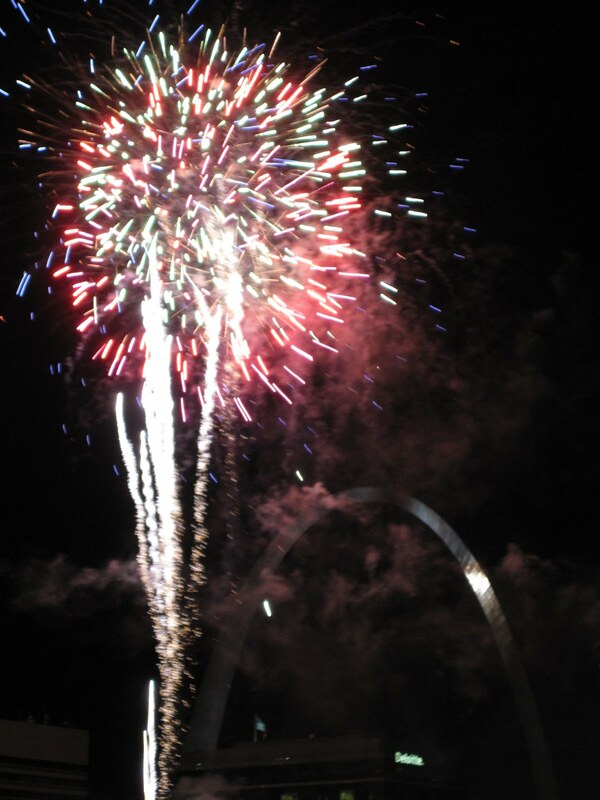 To end Friday night, after another fantastic Jaime Garcia performance, Busch Stadium had another fireworks night. And after getting to see the Mizzou Tigers marching band battle the Fighting Illini marching band before the game (Go Mizzou! ), it was quite a great end to an awesome night. We couldn’t wait to get to Saturday’s game. While almost everyone else was focusing on the fact that “the season is over”, we were busy enjoying a day we had been looking forward to since early this season – yes, I bought the tickets in May. 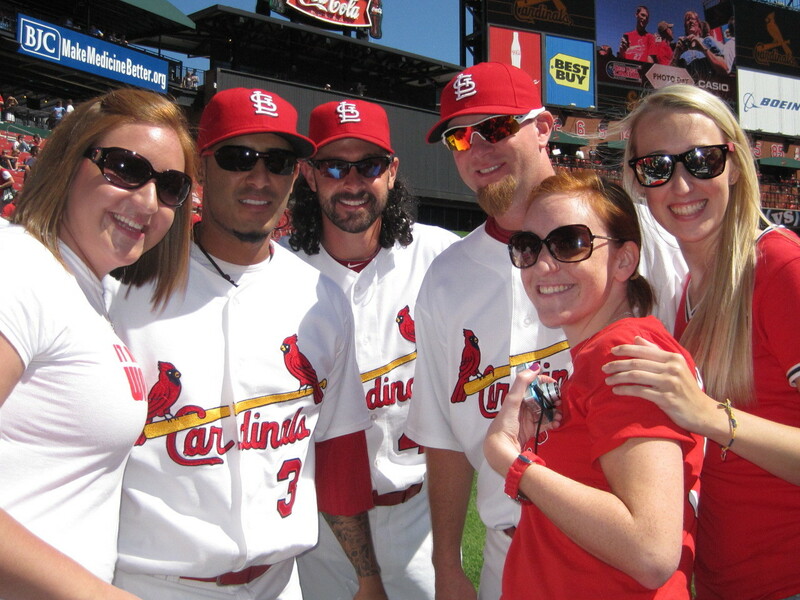 Saturday, September 4th was fan photo day on the field at Busch Stadium. Having missed out last year, I was determined to go this year and enjoy it to the fullest. 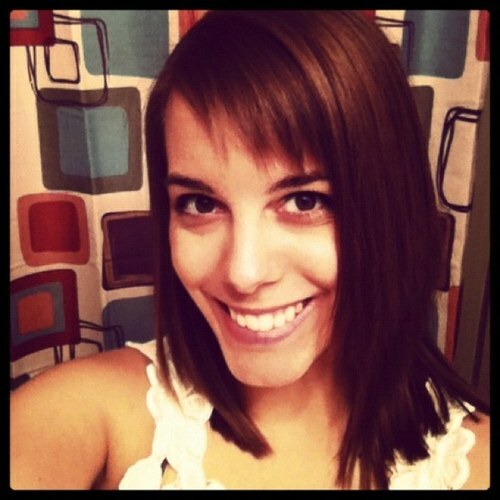 (Courtney’s friend, Laura, came with us – so that is who the blonde is in all of our pics!) Courtney had gone last year and I knew I couldn’t miss out. Although my fave (Luddy), who I had been looking forward to seeing earlier in the season, wasn’t there, I still couldn’t wait to go! We knew we were in a great position to get close to the players, having placed ourselves in kind-of a corner of the roped off area, we were certain there would be opportunity for us to at least try and get the attention of our favorites. We had NO idea what was about to happen! First the coaches made their way around the field, waving to the fans and being very courteous. 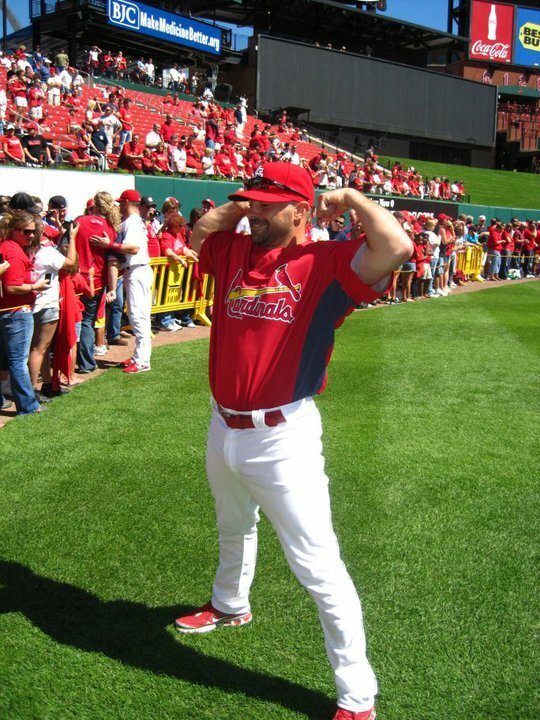 Then, the first round of players entered the field; Albert Pujols, Yadier Molina, and Jon Jay. Those three almost ran around the field so quick, I forgot they were even there! But, I guess since they were starters, it was understandable considering pre-game rituals and superstitions. 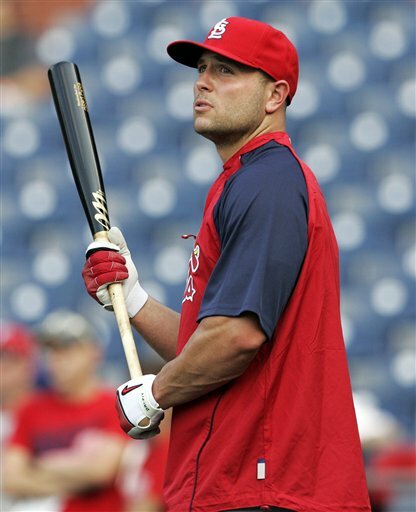 As more players proceeded to enter the field (Brendan Ryan, Randy Winn, Matt Pagnozzi, Nick Stavinoha – we called him Dr. Thunder and he got a kick out of it!, Pedro Feliz, Bryan Anderson) we saw Matt Holliday coming our way. Somehow, we got his attention and lured him over to take a photo with us! 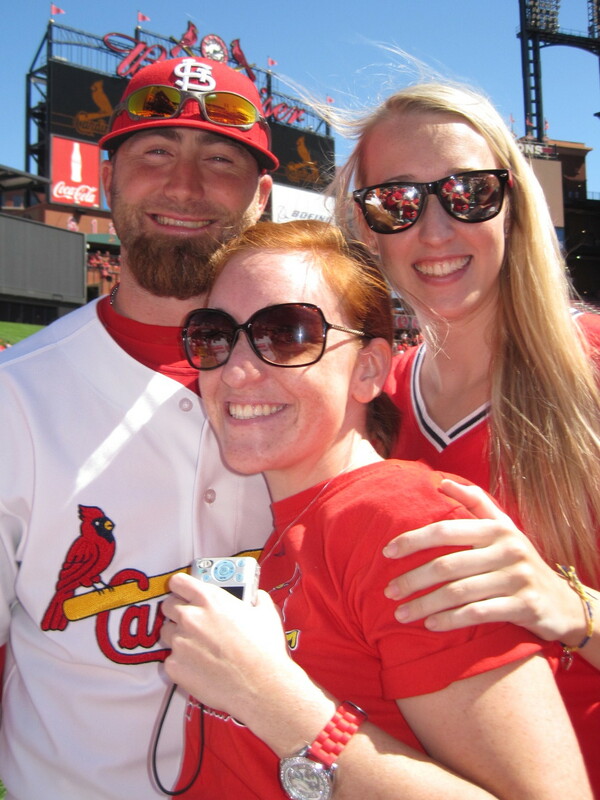 It was so surreal that we couldn’t believe it…he even had his hand on my shoulder! Pretty amazing. Needless to say, we were so stunned in our excellent convincing skills that we thought we would try it with other players as the rounded the field. Aaron Miles was one in the next group to come by. We talked to him for a second and he even stopped in his tracks to read my shirt, “It Ain’t Right til it’s Wainwright”, and he gave me the thumbs up (the pics below are him reading my shirt, and then posing for us) and told me he liked it. In fact several of the guys really liked my shirt; too bad Waino was pitching and he didn’t participate in photo day, so he couldn’t see the shirt like I had hoped. 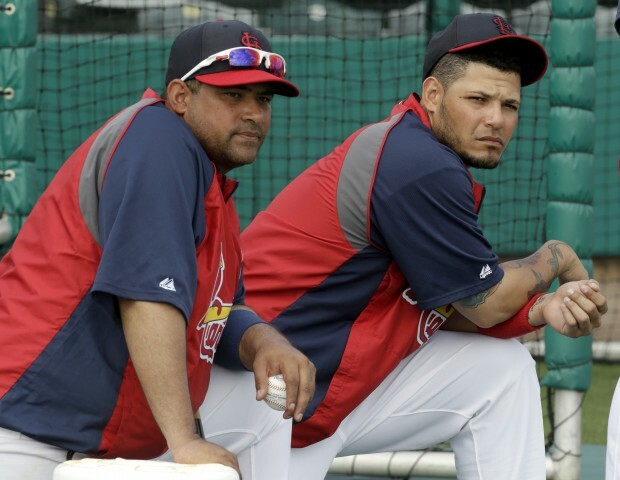 Dennys Reyes and Fernando Salas came around next. Again, very nice, but kinda scooted along without stopping to talk. The group of Felipe Lopez, Trever Miller, and Ryan Franklin were the next to walk by. Trever Miller was a hit with this crazy curly wig he wore (which he explained on the Sunday pre-game show to be a way to loosen up the guys and make them laugh in the clubhouse – it worked with the fans too!). While Lopez and Miller were stopped taking pictures with other fans, I chatted up Ryan Franklin asking if he would take a photo with us. He replied “Sure! Just a second, ok?” What was he waiting for? He was rounding up the other guys to come over and take a photo with us! Totally awesome of him. At this point, we were even more geeked and couldn’t wait for others to show up. 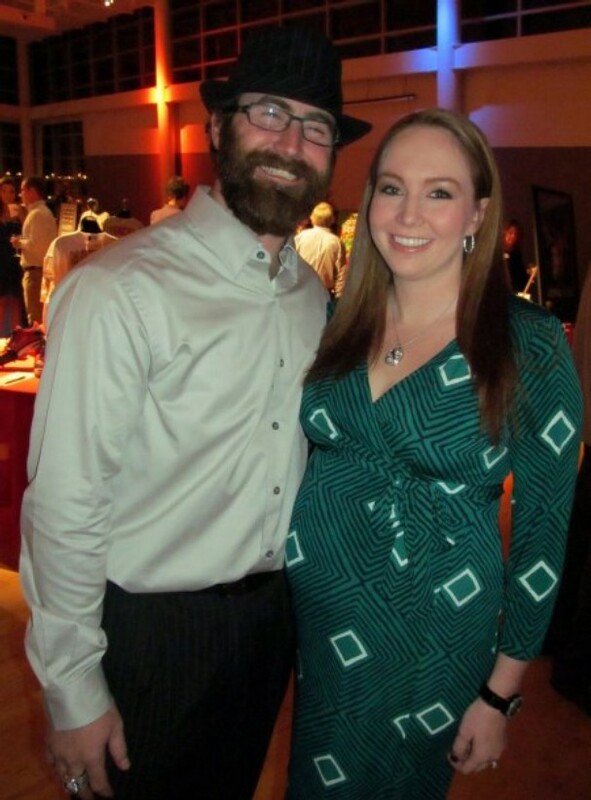 Courtney wanted a picture with Jason Motte and we all wanted one with Colby Rasmus. 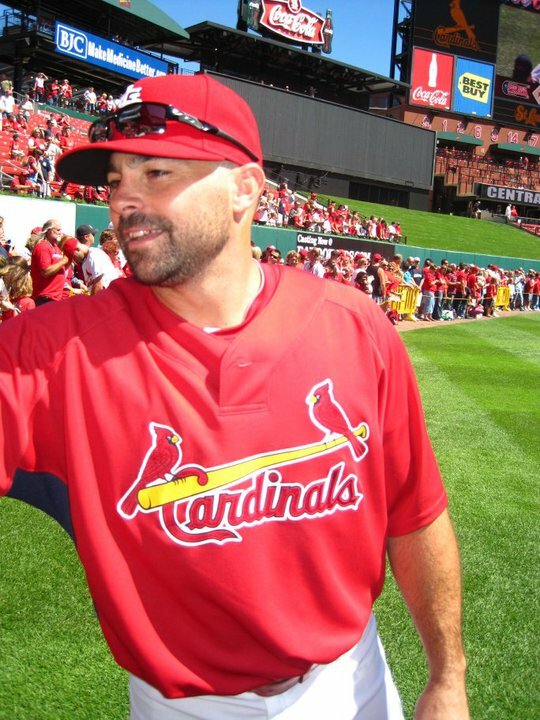 Jaime Garcia was also tops on our list. 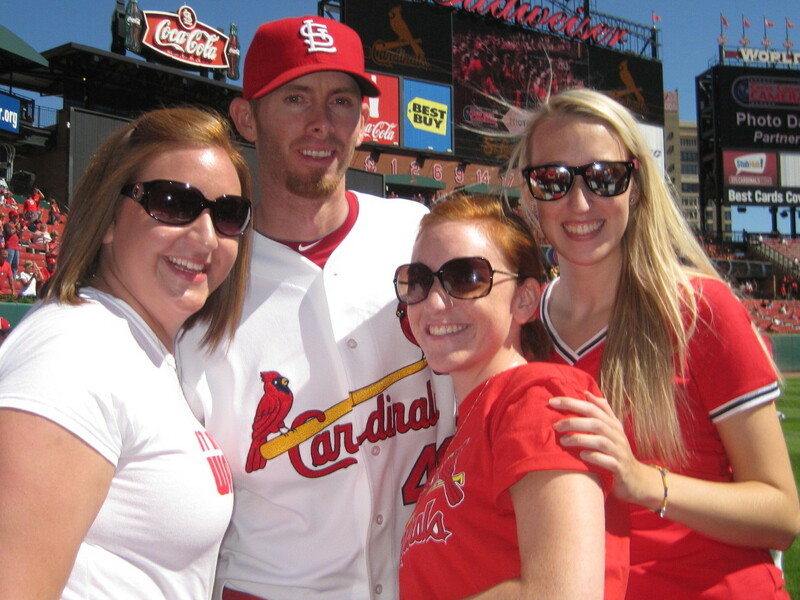 So, as they kept coming, we continued to reach out to the players to get photos with us as well as help a fellow cardinal fan who was much shorter than me standing behind us. 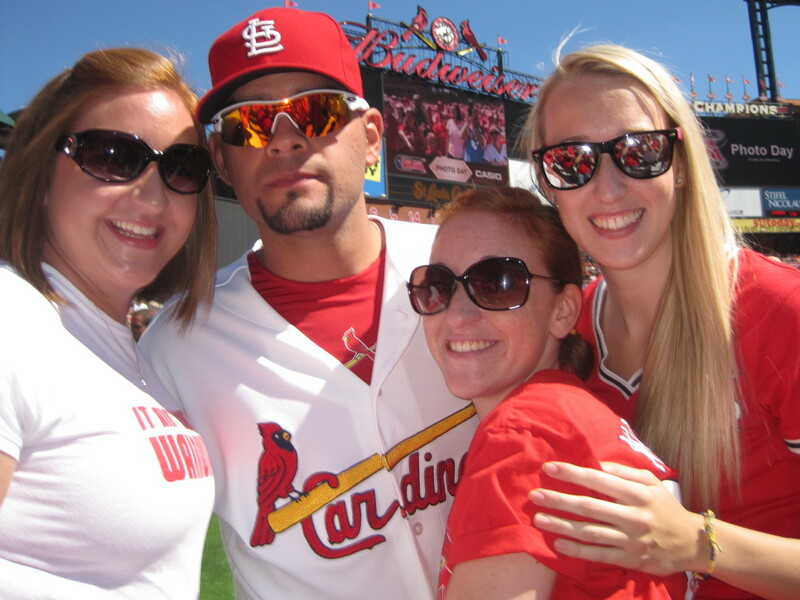 She was desperate for a picture with Skip Schumaker, so we made sure we helped her get one. For some reason, the guys just couldn’t say “no” to a group of girls begging for photos with them. This, of course, was good for us. Some of the bullpen guys made their way around the warning track and I got Mitchell Boggs while waiting for Jason Motte. Both pics were achieved and they were both so sweet to us. We expressed our appreciation for them stopping to take photos with us. When another group made their way around the corner, we noticed that Mike MacDougal wasn’t getting much love, so we asked him if he would take a photo with us… “Sure!” And we had officially made it up to 7 different players! 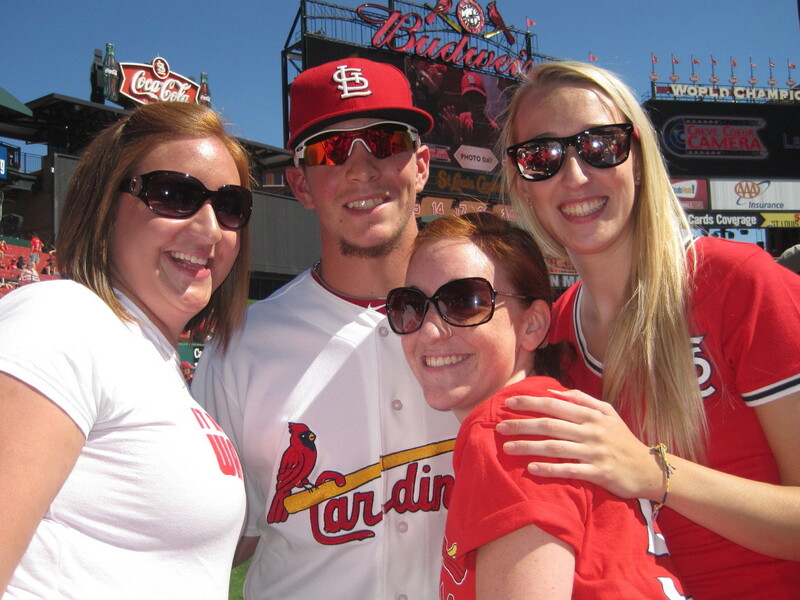 Meanwhile, we helped our short Cardinal friend we met get a picture with Blake Hawksworth. Courtney said to him “Hey, I follow you on twitter!” He was very responsive and said, “Really? That’s awesome.” Whether he actually meant it or not, he was very nice about it. 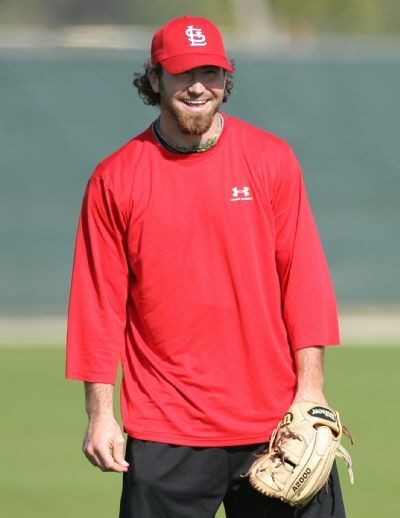 In the last group, we were super confident that we could get the last two on our list; Jaime Garcia and Colby Rasmus. 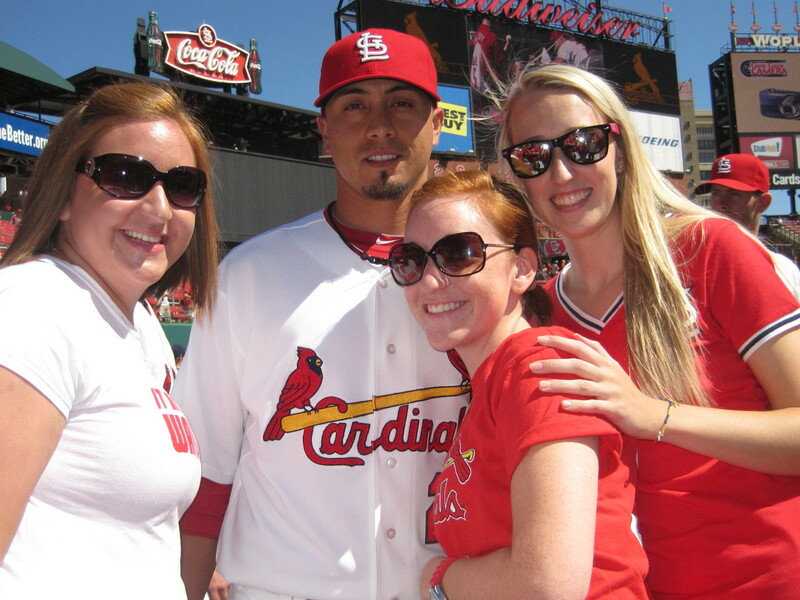 We were extremely successful and we also got Kyle Lohse in there too! All three had to be so tired of fans yelling at them and wanting pictures, but they were so sweet to us and obliged. What these guys might not know is that they made our day! Win or lose, we were never going to forget how awesome it was to get pics with all these guys. See, how we look at it is that this is our team. Whenever something like this happens, you seem to forget a stretch of bad play and remember that this is baseball, the sport we absolutely love. And they are the team that we absolutely love. Yes, they did lose, but there was no shortage of amazing memories that we will never forget. Thank you, St. Louis Cardinals for hosting this event and thank you to the players for being so amazing and courteous to the fans, we truly appreciate it. Hopefully this is just the beginning of many entries to come from us. 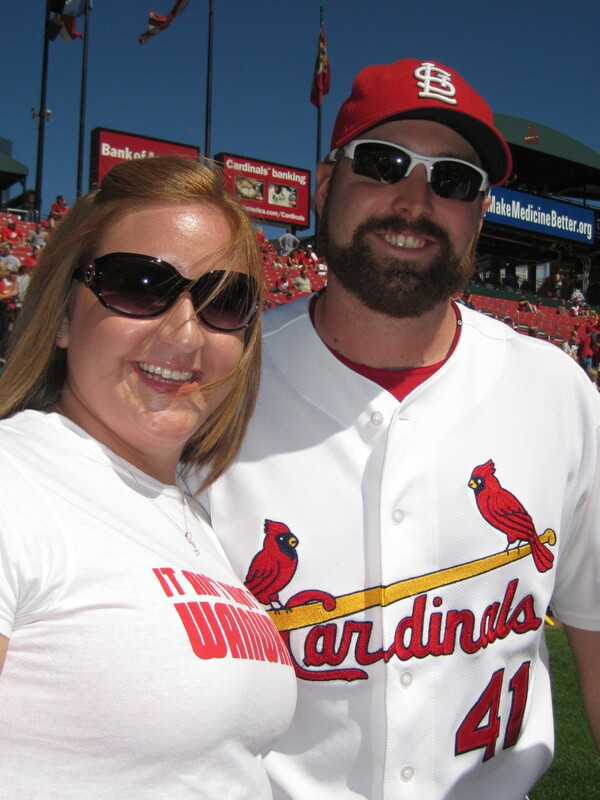 Courtney is divulged in pharmacy school, so you will mostly see my writing, but because we do so many things together (in regards to the Cardinals) it will likely be a combined effort. 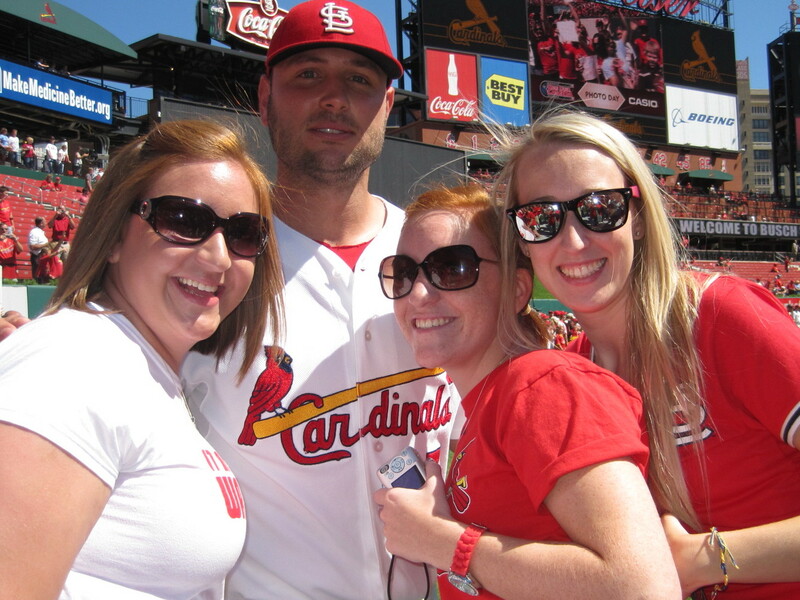 We really look forward to sharing our Cardinal experiences with all of you in Cardinal Nation! Production by the Pound plus Pics! 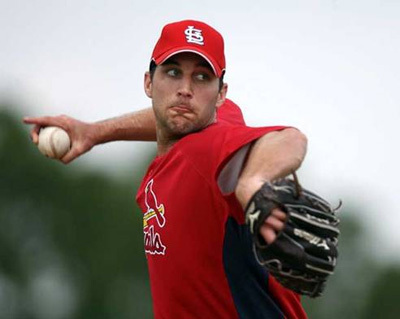 The Cardinals’ 8-2 pounding by the pondscum (Mets) is something we all want to forget, nobody more than pitcher Adam Wainwright. You know it’s bad when the postgame show’s ‘Great Play’ of the game is video of a confusing onfield delay during the 2nd inning when Yadier Molina suddenly decided he needed sunglasses behind the plate and everybody from Blake Hawksworth to Brendan Ryan and finally Albert Pujols himself was involved in fetching Yadi his shades. Today, I have a piece over at i70baseball.com that delves into statistics (I can hardly keep a straight face typing that!) 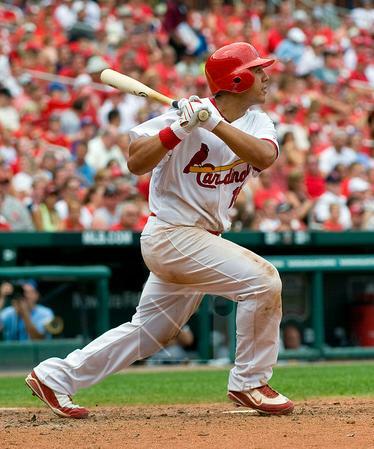 analyzing our Cardinals’ batting based on their body weight. Who gives the most bang for their hunk? Now, how about a few pictures, yes? 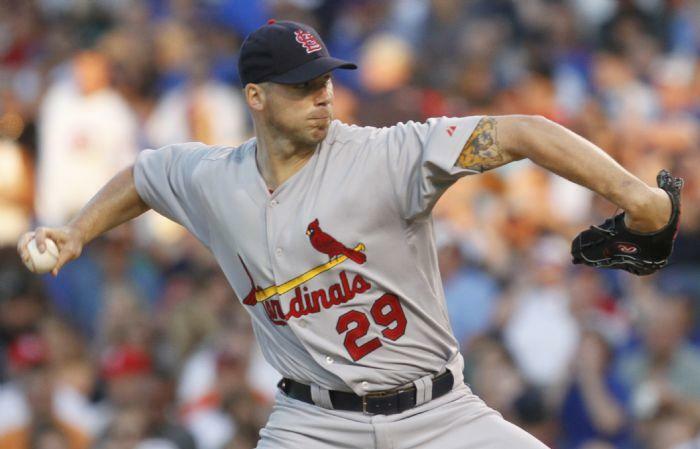 Ooh, someone finally caught at least a little of Chris Carpenter’s tattoos! So… the last two games. They happened. The great thing about baseball is that we have another game to look forward to. Today. 2:10. Chris Carpenter vs. Ubaldo Jimenez. It promises to be a pretty fantastic match-up! On to the week in pictures (Sorry, no sadness here)! Ang wants a Brockabrella. No really, she does. Who can make it happen?! See? 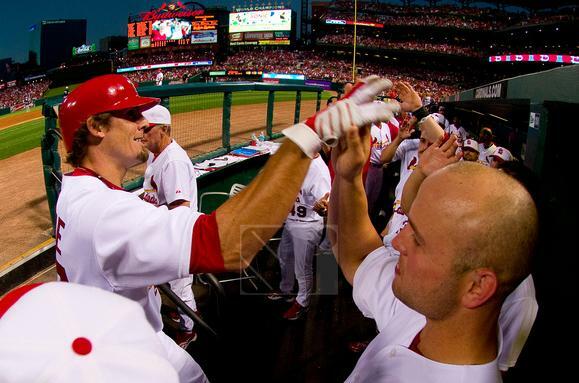 Even Matt Holliday is happy to see him back! Now this? This is just an awesome picture. Would you run on this face? Not a chance. It’s not every day a B-52 flies over before the game! back in business in St. Louis! 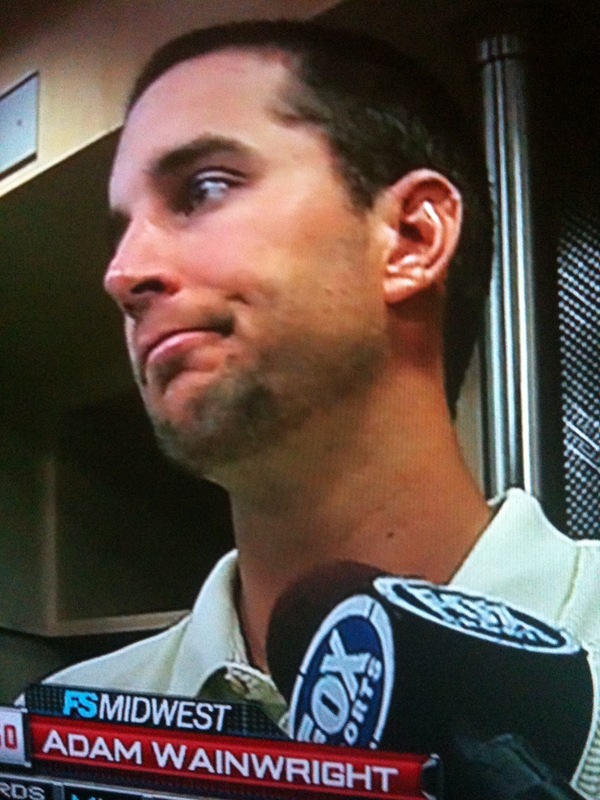 Ho hum, another complete game for Adam. We don’t like – we LOVE these games! Best picture we’ve had yet? Probably! Let’s just forget yesterday happened. Rockies – who? The Cardinals haven’t even played them yet this season! Tonight will be the first time in 2010 because the calendar always goes from July 5 to 7, right? 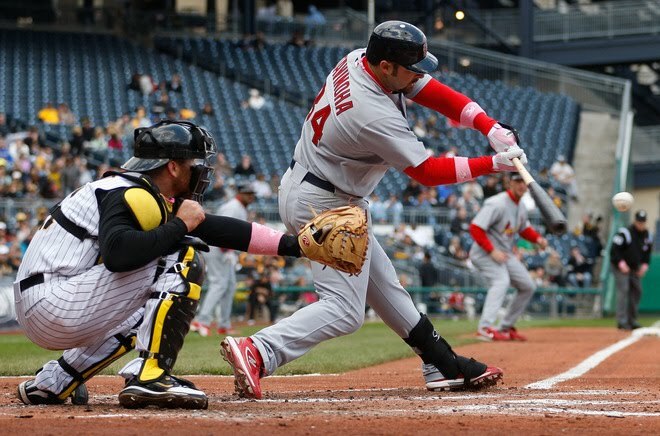 Although I guess ignoring the game would mean ignoring that the Cardinals did score 9 runs last night – 3 on a powerful two-out Matt Holliday homer (with a runner in scoring position!) 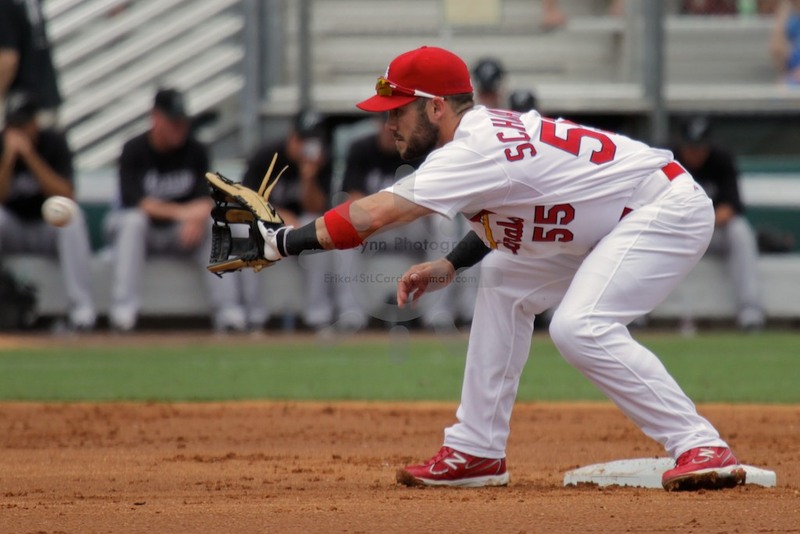 – which is definitely a plus for this season’s mostly inconsistent offense. That also would overlook the fact Blake Hawksworth pitched well enough to continually get out of trouble for five innings. 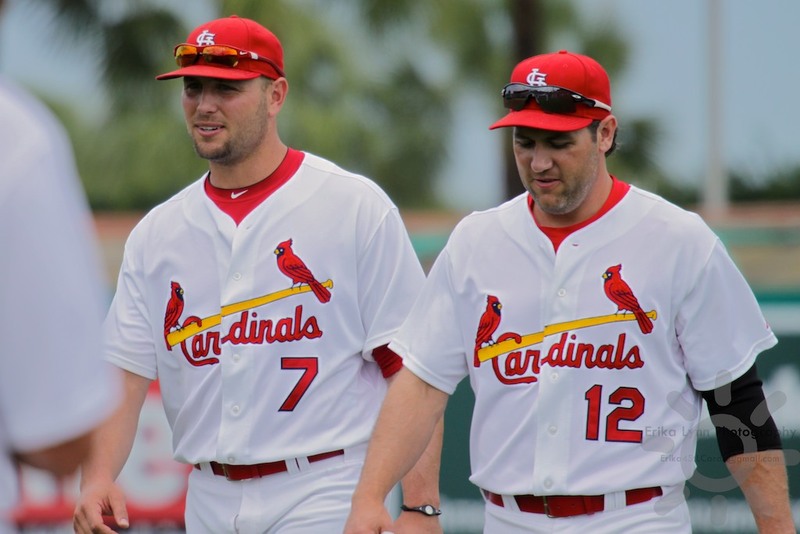 So maybe we’ll just forget the 9th inning and instead look at five bright spots on the 2010 Cardinals. 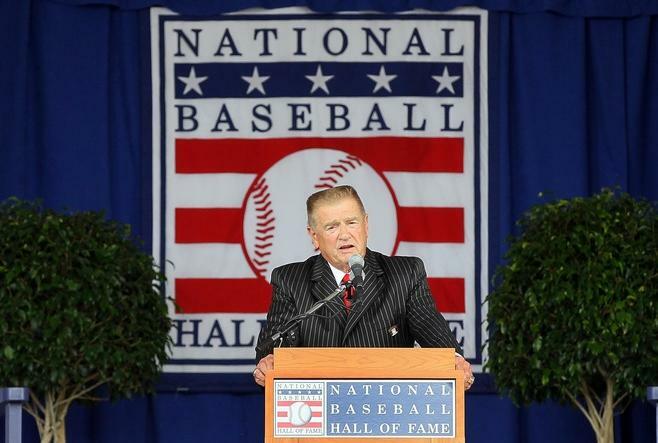 He had a “perfect game” and more earlier this season, when he retired 32 consecutive batters. He’s been a reliable, and entertaining to watch, presence from the bullpen and has 36 strikeouts in 33 innings pitched, as well as two saves. 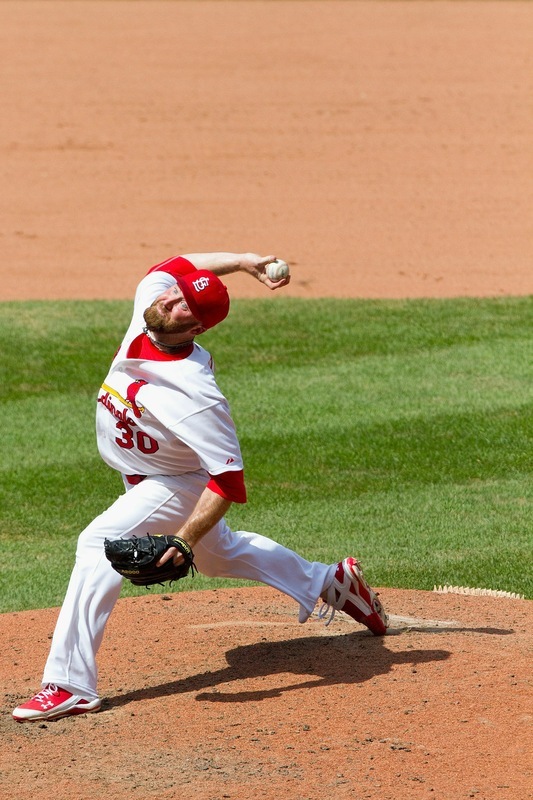 As noted in the Post-Dispatch last Thursday, Boggs is thriving out of the Cards bullpen. At that point, “in Mitchell Boggs’ last two appearances, the Cardinals’ reliever has entered the game with opponents on base, a taut game on the line, and an All-Star or a .320 hitter as his assignment. He’s managed to retire both of them. It took him two pitches, total.” Since then, he’s pitched 2.1 scoreless innings, giving up two hits and striking out two. A Baby Bird who’s been around the whole season, Nick has been playing more regularly instead of just pinch-hitting as he’d done earlier in the season. He’s hit a little better off the bench than as a starter, and both of his homers – including the memorable one off Trevor Hoffman at the beginning of the season – have been when he’s pinch-hitting. Let’s save the best for last. Is there anything he can’t do? Not only does he lead National League pitchers in strikeouts with 123, is second in the NL with 12 wins and is third in the league with a 2.24 ERA (just behind Jaime Garcia’s 2.10), he also has hit 4 doubles and has 4 RBI this year at the plate AND scores game-winning runs when he pinch-hits. 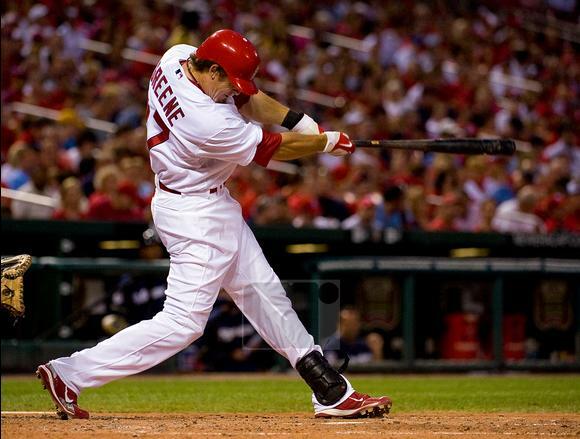 He has finally been named to the All-Star team as well – could he be the starter for the National League? That would be a well-deserved honor. Here’s one more bright spot: the Mets beat the Reds last night. 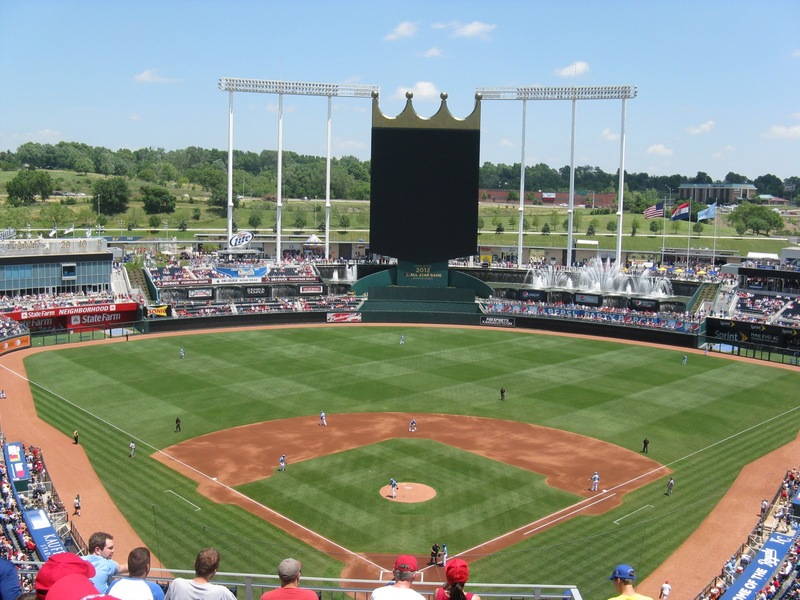 My trip to Kauffman Stadium in Kansas City for Saturday’s Cardinals-Royals game marked Major League ballpark number 15 that I’ve visited. And other than sitting in the bleachers at Wrigley Field on my 21st birthday, this was the hottest game I’ve ever been to (temperature-wise, of course). Luckily, the Cardinals made sitting in that heat worthwhile. Kauffman Stadium has always looked beautiful on television, especially the fountains in the outfield, so I was excited about the game. (Then again, I was seeing the Cardinals. How could I not be excited?) I went to the game with my friends Michael and Tammy, who live in Omaha, so we had a three-hour drive to get to the ballpark. As we came to a complete stop before even reaching the I-70 exit for the ballpark, I discovered one problem with Kauffman: it’s difficult to park there. Once you are able to exit, and temporarily think you’ll be there soon because there’s the ballpark – no. You have to wind around and around, merge into one lane countless times and, finally, eventually, get into a real parking lot. We did get a good view of the tailgating going on (which reminded me of Miller Park in Milwaukee) as we drove toward the lots. Plus we got a great view of Arrowhead Stadium from our parking spot right in front of it. The employees at Kauffman all seemed very friendly, from the usher who told us our seats were in the sun to start with but would be in the shade soon to the concession stand worker who apologized for having to double-check she’d charged us for the right number of hot dogs. 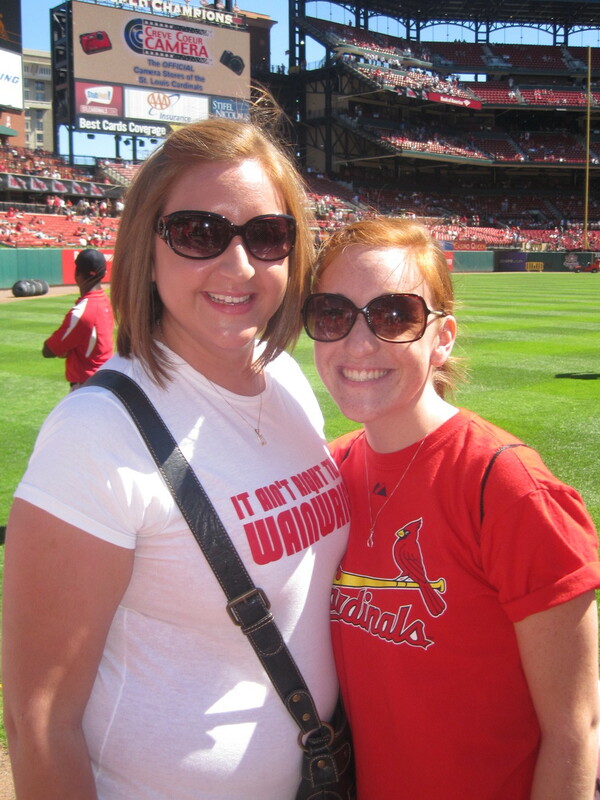 Of course I was wearing a Cardinals shirt, and was in the majority that day wearing red. And the gift shops were ready for the red-clad fans too, with Cardinals merchandise for sale. The concession prices seemed reasonable and there was a good selection, including Kansas City barbecue. Given that it was so hot, it was great that the concourse was cooled by overhead fans and that there were three gigantic water coolers with paper cups on a table leading toward the seats. There also was a drinking fountain right outside the bathroom, where many people were refilling water bottles. Speaking of water, the fountains in the outfield at Kauffman have always looked beautiful on television and they are definitely the most picturesque feature of the park. 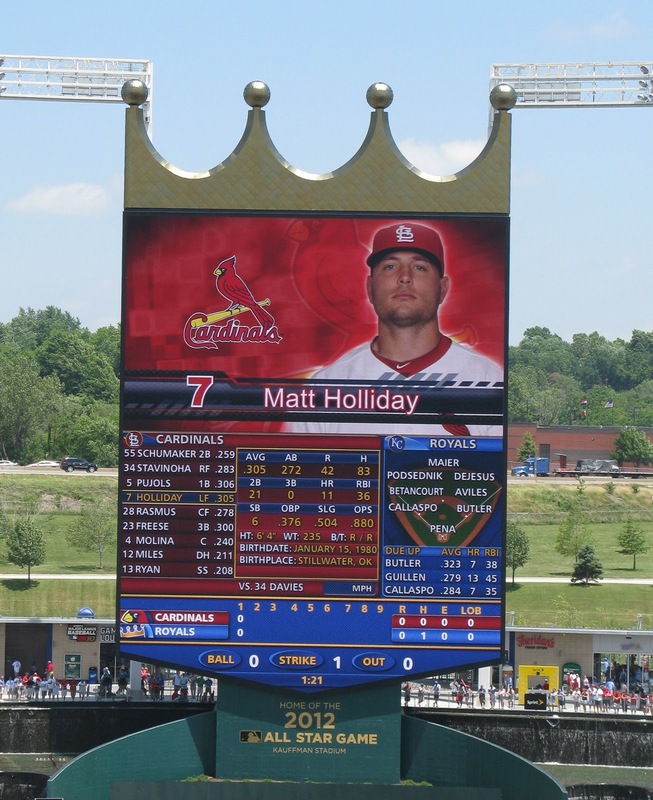 The scoreboard is also very nice, with it crown on top, but almost filled with too much information. It was easy to get sidetracked reading the facts and stats and almost miss an at-bat completely. 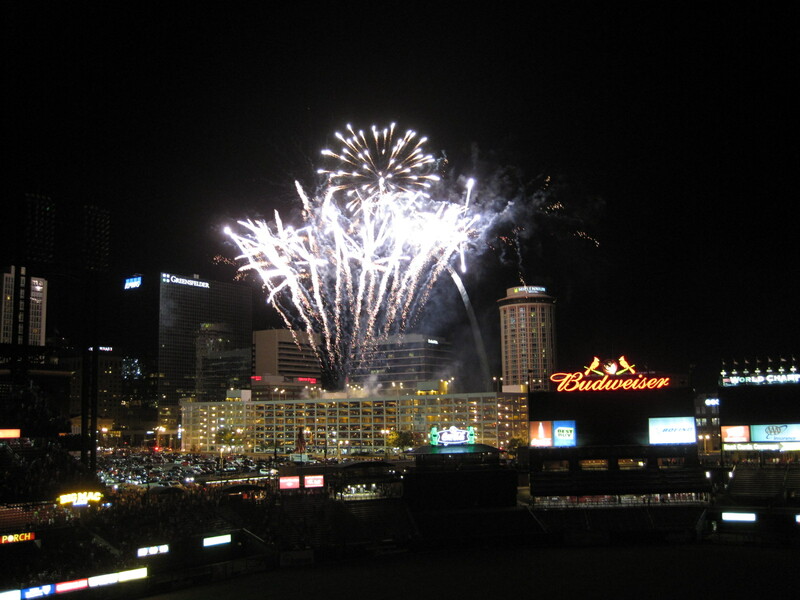 Many Major League parks have their tradition of playing certain songs during games – “Sweet Caroline” at Fenway Park, “Beer Barrel Polka” at Miller Park and “Thank God I’m a Country Boy” at Camden Yards. At Kauffman, it’s “Friends in Low Places” by Garth Brooks, complete with Garth introducing the song on the big-screen and lyrics so you can sing along. Seems an interesting choice for a song, given the Royals typical finish in the standings. As Angela mentioned in her post about Friday night’s game, there was a definite sea of red when you looked around the stands and the cheers for the Cardinals on Saturday were tremendous. However, when there was something for the Royals fans to cheer about, they made themselves heard. Well, most of the time. 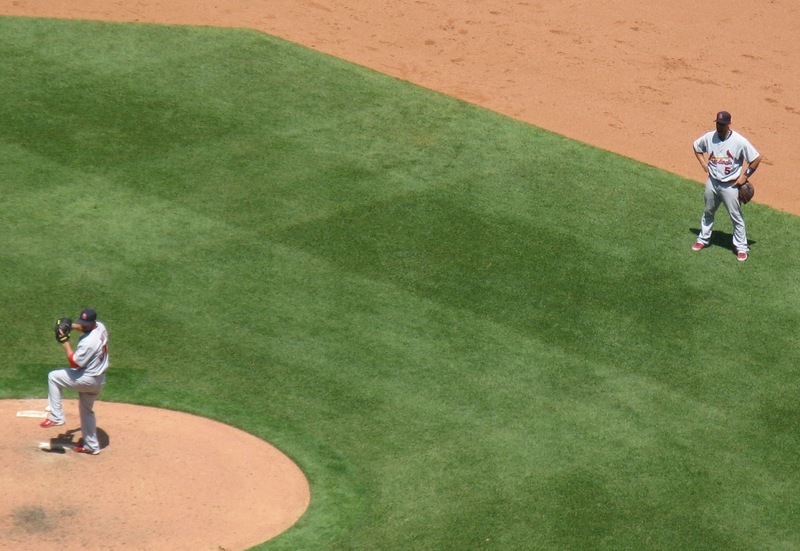 Highlights of the 1985 World Series were shown after each inning – one game per inning. Not being a Cardinals fan in 1985, I wasn’t sure who won each of the earlier Series games (of course I know about the final two games), but it was easy to tell by the music accompanying the highlights. 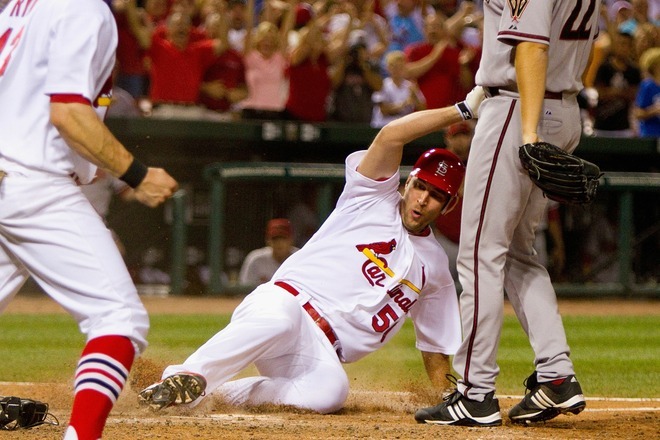 Sad, slow music: Cardinals won. Upbeat music: Royals won. After the sixth inning, I’m not sure what the music was. All I could hear were boos. As mentioned, I was with Michael and Tammy for this game. Tammy and I went to quite a few Quad Cities River Bandits games together years ago, back when the team was an Astros and then Twins farm team. So this was, in all likelihood, not the first time we were together watching Aaron Miles play since he was on the Bandits in 1997 and 1998. Yes, I have to mention Aaron Miles right away. 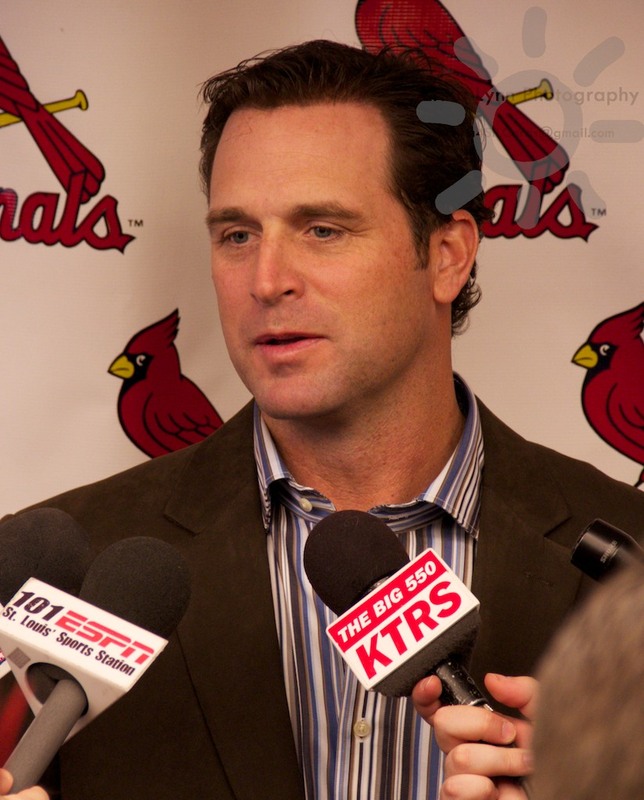 Michael is, to put it mildly, a passionate Cardinals fan. And (as is the case for many of us) he’d prefer to see any of the Baby Birds on the roster to Proven Veterans such as Miles. So, there was Miles – not just playing on Saturday, but the designated hitter. “If that isn’t an argument for abolishing the DH, I don’t know what is,” Michael said after the lineups were read. So, to be obstinate (or maybe it was the heat), Tammy and I cheered like crazy for Miles. 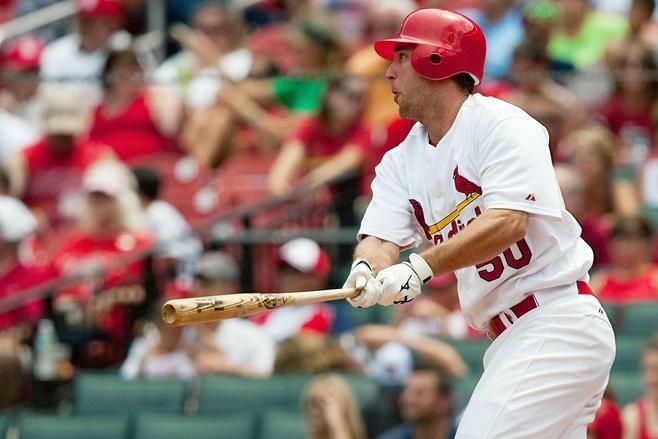 He responded in his first at-bat by getting the Cardinals first hit. “He doubled just to piss me off,” Michael responded. 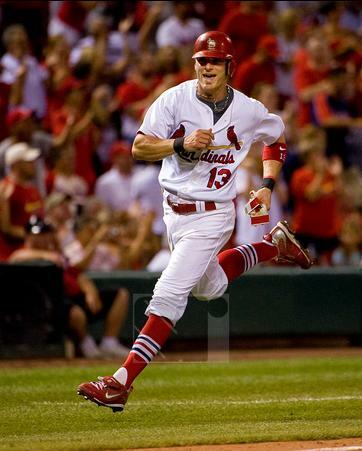 He also singled his second time up, scoring on Skip Schumaker’s homer. Yes, the homers – first the Colby jack in the fourth and then Skippy’s in the fifth. Wonderful to see, great to be part of the roaring crowd and interesting to hear the following from Tammy immediately after Colby hit his: “I just got chills.” Which always happens when it’s 95 degrees, right? But I saw proof, since it happened again after Skip’s homer: she seriously had goosebumps on her arm. Pitching-wise, Blake Hawksworth had a very impressive five innings. 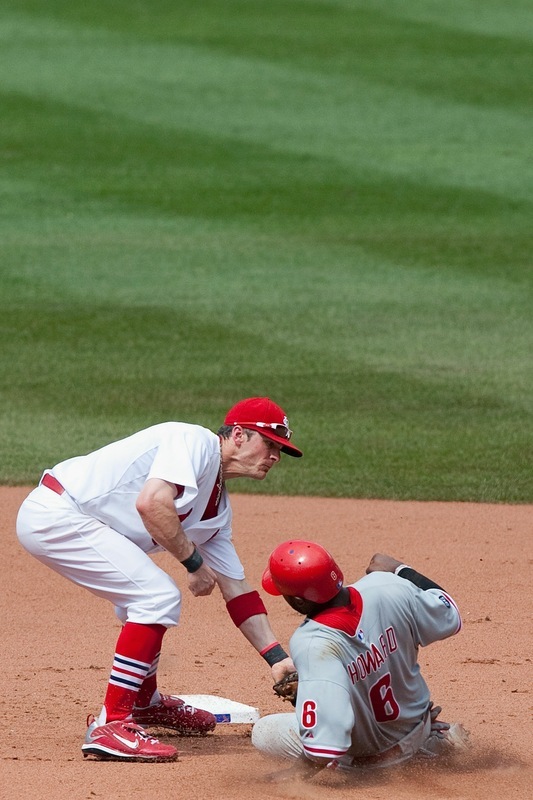 The sixth inning had a couple of pitching changes, as first Trever Miller and then Jason Motte came into the game. 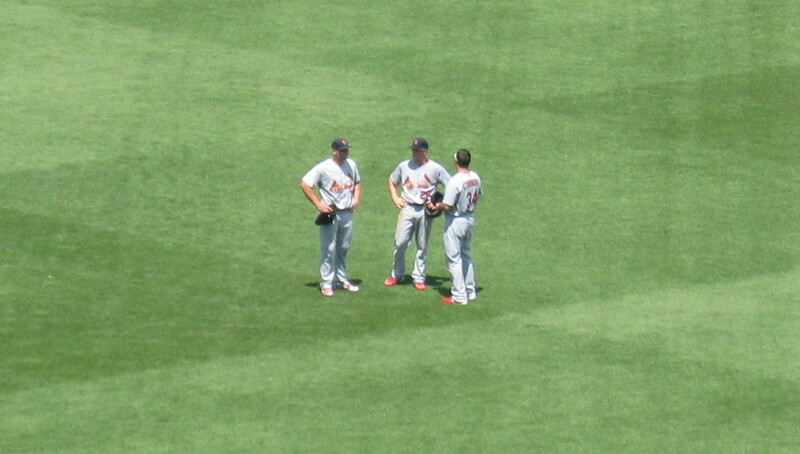 It was while Motte was warming up that we noticed Matt Holliday, Colby and Nick Stavinoha meeting in centerfield. Then we saw David Freese and Brendan Ryan standing together and chatting. Which meant that Skippy and Albert were together too, right? No. Skip was all alone, and Albert was doing this. 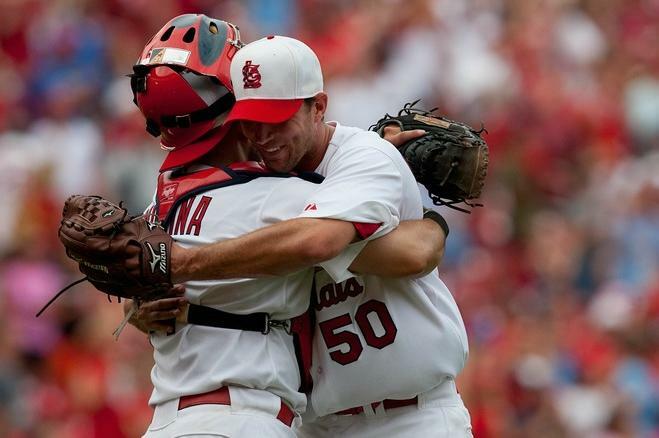 All in all, it was a nice 5-3 win for the Cardinals, and especially good to see Ryan Franklin have a one-two-three ninth inning for his 15th save. And Kauffman Stadium is definitely worth the visit. Hopefully, though, the next time I’m there they’ll be done talking about the 1985 World Series. Twenty-five years seems like enough.